The HomePod firmware Apple released early continues to offer up insight into future software and hardware capabilities for the HomePod, iPhone 8, and other devices, with the newest discovery coming today developer from Guilherme Rambo. He's unearthed a new "SmartCamera" feature, which appears to be something that will be built into future iPhones and/or iOS 11, perhaps taking advantage of the new facial recognition software that we expect to see in the iPhone 8. The firmware suggests the camera app will be able to detect different types of scenes, photo conditions, and photography subjects like pets and children. Several scenes are referenced, including Fireworks, Foliage, Pet, BrightStage, Sport, Sky, Snow, and Sunset/Sunrise, indicating the iPhone's camera may be able to detect a scene and then set the ideal exposure, shutter speed, and other factors to take the best photograph. 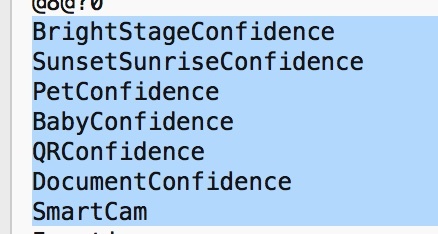 Many cameras, from point and shoot models to DSLRs, have a range of scene presets that can be selected, and it looks like Apple's planning to implement something similar. There are also specific references to a "freezeMotion" feature that mentions face scenes, pets, and babies, perhaps pointing towards new scene detection functionality that can recognize a fast moving target and automatically capture a photo at an ideal moment. A third screenshot covers several "Confidence" metrics and hints at the camera's ability to recognize not just pets and babies, but documents and QR codes. Both document scanning and QR code scanning with the camera are built into iOS 11, so at least some of these features will be available for all iPhone models. It's not entirely clear, however, what will require the facial recognition hardware rumored for the iPhone 8 and what will be available for other devices. Existing iPhones running the current version of iOS already include object recognition functionality, but it's limited to the Photos app right now. The Photos app uses AI to detect objects and people in photos for smart search and organization, and it seems some of that technology could be making its way to the Camera app going forward. The HomePod firmware contains hints about future iOS 11 functionality and the iPhone 8 because the HomePod runs a full version of iOS. The current version of iOS 11 in testing has been stripped of references to unreleased features, but Apple neglected to make the same edits to the HomePod firmware, allowing enterprising developers to dig up the company's secrets. Apple has accidentally leaked the general design of the iPhone 8, confirmed that it has an infrared facial tracking mechanism, and given us hints of several upcoming features like a split status bar at the top and a tap to wake feature. It also seemingly confirms both a virtual Home button and function area along with the absence of an under-display Touch ID solution. 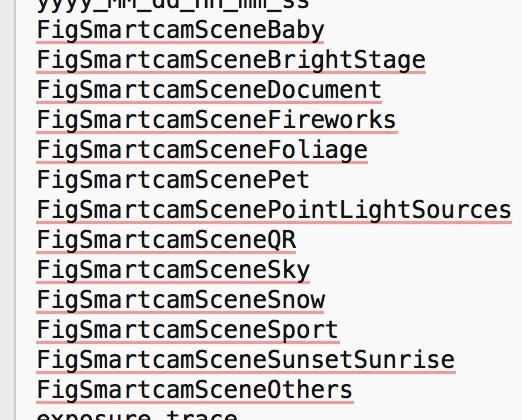 The firmware suggests the camera app will be able to detect different types of scenes...indicating the iPhone's camera may be able to detect a scene and then set the ideal exposure, shutter speed, and other factors to take the best photograph. AND when you start making out on the sofa Apple Music will automatically start up a Marvin Gaye set list. I mean talk about scene detection. How is this oS revealing so many things, whats different than other OS apple makes, did someone make a mistake and published un-encrypted part of code or something ? Can it detect Hot Dogs? Whoever worked on the HomePod firmware is gonna get fired lol. Marketing at its finest. Just another way of Apple trolling us weeks before the September Keynote to keep all us all triggered. It's working. It was very clearly a mistake. The file still “downloads”, but has now been obfuscated. The .zip file no longer opens properly. Don't you believe it. I used to work at the R&D site of a major car manufacturer. I was in a meeting with two very senior people when a person popped in to tell them that some photographers were hiding in the bushes, outside the perimeter fence by the exit ramp. They immediately ok'd it for 2 camo-covered cars to be driven out. Playing the media game is smart business. So does this mean I'll have to unlock my phone with my cat? The HomePod firmware contains hints about future iOS 11 functionality and the iPhone 8 because the HomePod runs a full version of iOS. The current version of iOS 11 in testing has been stripped of references to unreleased features, but Apple neglected to make the same edits to the HomePod firmware, allowing enterprising developers to dig up the company's secrets ('https://www.macrumors.com/2017/07/29/homepod-firmware-details-apple-smart-speaker/').